Wow! What a day! We're running the generator tonight because the local power has been off all day. That's not news around here. We attended Leader Memorial United Methodist Church this morning. Surprisingly, worship was only about 3 hours today! We spent the afternoon playing with the children today. They also took a walk to a nearby school where the kids showed us a crocodile. We adults are worn out. Each evening, we attend vespers with the children. Tonight, they recited all the books of the Old Testament to us. Tomorrow, we will go over infection control with the hospital staff. We will give immunizations to the children, and give them dental screenings. For those of you who have been here yourselves: Ibrahim stopped by today, and he is reported to be cancer free. Mohammed, who was a porter at the hospital and is known and loved by many, is still recovering from his injured leg. Mother Emma continues to be an inspiration. The post Sierra Leone Medical Mission Trip: November 2010 appeared first on Today I Saw God. Okay! Sorry we have been icognito, but we have been traveling, and we finally made it, and we are finally in a place that has power and internet! We arrived at Heathrow Friday morning about 10. After a couple hours there, we flew to Freetown with one refueling stop in Malaga, Spain. 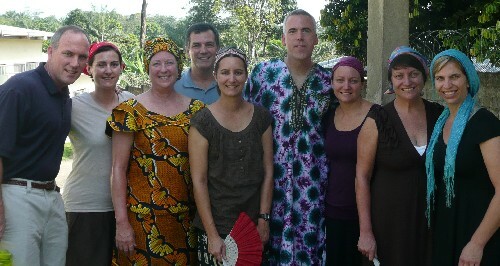 We arrived after dark at the Freetown (in Lungi), and spent the night there. We rode the ferry across the harbor to Freetown this morning and drove about 4 hours to Bo. Everyone (and all of our luggage!) have arrived without a hitch. At least one of us got to see Big Ben, the Eye of London, Parliament, the Rock of Gibraltar, and the Sahara desert all in one day! We have unpacked our bags in the Missionary Training Center (nicer than the hotel in Lungi! ), and have toured Mercy Hospital and the Child Rescue Center. As one of our team put it: "Who wouldn't want to spend two weeks receiving constant hugs from the children!" All the children here loved seeing pictures of our families.